Spiritual preparedness is your core belief system that guides you and serves you throughout your walk of life. When you are spiritually prepared for a disaster, you are better able to handle the stresses that the disasters throws at you and find solutions more quickly. We tend to play stories in our head. Whether they are truth or fiction, we live through these stories and feel them as if they are really happening. When I began Ready Nutrition two years ago, I plunged myself head first into every preparedness book and article, studied every possible disaster I may run into, and every grim scenario. Needless to say, I was playing a 24-hour TEOTWAWKI scenario in my head and became weary as a result. In my mind, I was not studying it, I was living through it. Even though, I prayed regularly and had accepted God into my heart and lived a Christian life, I found it hard to cope because there was something missing. I realized I had not put any thought into my spiritual preparedness before I began this arduous preparedness journey. I am sharing my doomer fatigue experience with you because I want each of you to know that the end result of not preparing your spirit for hard decisions and troubling times will effect your overall well being and make it all the more difficult for you to shake the effects of the disaster away. The longer you stay in the shock and awe of the disaster moment, the longer it takes for you move into surviving. Choosing to prepare now is a choice you made with your spirit to survive. You are putting plans in place, purchasing basic living items, tools, and presently you are working on your spirit to be prepared. 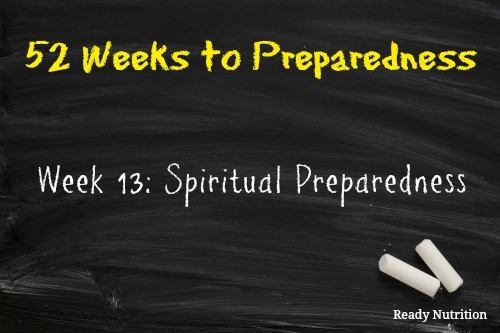 When you are spiritually prepared, the groundwork is then laid for mental preparedness (something we will dive into next week). As James Allen once said, “Every man thinks, lives and acts in exact accordance with the belief which is rooted in his inner most being.” Essentially, spiritual preparedness is your moral compass that guides you through the good and bad times. It is your core beliefs that make up who you are and serve you throughout your walk of life. These beliefs are what guide you, motivate you, sustain you or they will do the complete opposite. They will either become a negative or positive influence depending on what they hold as truths about the nature of yourself and your reality. Am I what I want to be? Do I have the courage to make the hard changes to be a better person? Do I have the courage to turn away from bad habits? What would I do if a neighbor needed my help? How far would I go to help my neighbor? If a relative needed food, would I help them? Why is it important to help others? Would using a gun on a home intruder be something I could do? Why would I feel bad about it? Would I feel responsible if I could not help someone medically and they died? Why am I taking that burden on? Working and further developing your moral compass will help you in finding the answers to tough situations during disasters. Most importantly you will find peace in the midst of adversity. Possessing this spiritual preparedness will lay the groundwork for being mentally prepared for disasters. The card game, Conflicted to exercise your spiritual preparedness and learn what you would do in certain survival situations. 2. Knowledge is power. Reading inspirational books and printing out inspirational passages that call to you is a tool that many use to stay spiritually awakened. In addition, reading survival books and survival fiction can help the reader look at preparedness from different perspectives and learn more about their spiritual foundation through the characters of the books. Devotional studies have helped many in developing their spiritual preparedness. 3. Acknowledgement and gratitude are other ways that you can begin laying a spiritual foundation. I have often started my prayers with how thankful I am for the family, friends and events that shaped who I am. Even the bad events played a part in who I am. I then follow the gratitude with further prayers. After I am done, I feel at peace. 4. Find passages in a book or religious reference and writing it down for you to turn to later also helps. In my preparedness manual, I have an entire section of my book that has inspirational quotes and bible passages that I have printed out or found that has touched me. In addition, I have all of the church handouts that I have received over the years to turn to. 1. Find some time and think about your core beliefs. What do you believe in? What drives you to be a better person? 2. If you feel open in discussing your belief system, talk with family members and find out what they believe. 3. Set up a time daily where you can sit and meditate on your spirit. 4. Begin exploring ways to advance your core beliefs to spiritually prepare yourself. 5. Practice your spiritual beliefs daily. 6. Talk with a spiritual advisor, pastor, or priest if you reach a place where you need guidance.